For this week's makeup look I wanted to use the MUA Glamour Nights Palette and play with that RED! Bright red shadow is completely out of my norm, so this was an exercise in stepping out of my comfort zone and creating something bold and colorful. I really love the end result, hope you do too! Hope you have a wonderful week!! Thank you so much for stopping by. Always love it when you do! Ha!! I would love to :-) Thank you, Vicky! 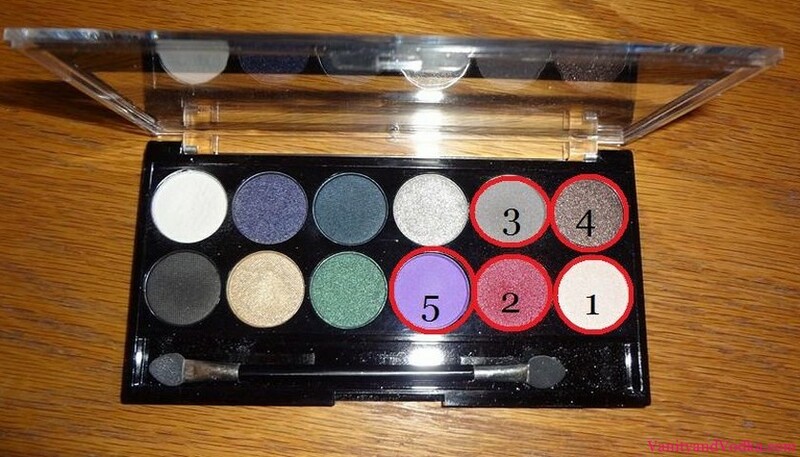 I love this palette & i love what you did with it! Shade #4 looks very pretty! So glad you like it, Janine!! xoxo! Traci you are the sweetest! That means the world to me! Your so good at the eye makeup thing. I can learn so much from you! Beautiful, I love the purple on the lower lash line! So glad you like it, Kayla! Thank you! So pretty...I'm learning so many great tips from you! Red shadow is out of my norm too but have tried it recently and found that it can really look great. Thanks for the inspiration! Wow!! Thank you so much!! I totally appreciate that, Mollie! You are too sweet! Gorgeous as always!!! Love the splash of cranberry on the lid too! Thank you, Sweet Thang!! Always love hearing from you!! Hope all is well! HA!! A tale of a unicorn?? How cute is Kristi :-) You've got to show me how you use those colors!! I would love to see it!! Facebook message coming now! !